Because Normality should not be an Illusion! 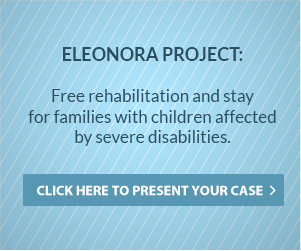 “Give a little bit of normality to those who need it, because Eleonora’s dream was exactly that: Simply … a Normal Life”. The beneficiaries of our activities are children and young people affected by chronic disabilities, as well as their families, whose necessary daily psychological and physical commitment sometimes seems impossible to face. The association does not address one particular disease nor dedicate all its time and energy to one single illness. Our aim is to be close to those who are in need…in particular, to those who feel that Normality is an illusion! The association periodically regularly reviews the projects that it feels it should concentrate its energies on and determines with what operational procedures it might achieve its objectives. The website is a means to raise funds and an easy way to inform people about how these funds are used.